Made To Measure Venetian Blinds. UK Online orders from Bay Blinds Limited. These beautifully crafted wood slat blinds are made from either Basswood, of which there are copious supplies around the world or Ramin, which is sourced from FSC approved managed forests. As wood is a natural product, there is often some colour or shade variation, sometimes between slats or between slats and pelmet, this part of the interest and excitement of wood products and gives these blinds their beautiful appearance. Standard specification: wooden toggles, ladderstring and flat pelmet. Headrail on all sizes 57mm x 38.3mm. 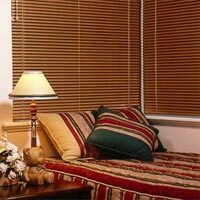 Our range includes three types of wooden Venetians. The Premium is our most popular with three slat widths with a flat pelmet, ladderstrings and wood toggles as standard. You can add brass toggles for that extra bit of style or woven ladder tapes to give that different, more robust, textured, designer appearance. The vast majority of blinds fit into the window recess, but for those wooden Venetians that require fitting to the outside of the recess, choose a mitred pelmet for that final finish. For that stylish "Retro" look, you could go for the Deco 50mm wood Venetian. This is a modern copy of the original design of Venetian blinds from the 1930s where brass effect tilt controls are exposed in the headrail. These blinds are a little more expensive but in the right setting, they look simply stunning! The final wood Venetians are our Value blinds, they cost a little less than the Premium/Continental, but where the normal delivery is 12 to 15 working days, these blinds are on 4-5 working days. They are available in 25mm and 50mm and in the Natural and Golden Oak finishes, our most popular choice of finishes by our customers. These blinds are supplied to the exact size that you order and are cut down from oversize blinds kept in stock, hence the speed of turnaround. The blinds are made to the same exacting standards and are the complete equal of the other Venetians; the only slight difference may be the distance of the ladderstrings from the edges on different blinds. This will only be noticeable when you have more than one blind of differing sizes in the same room. On these blinds, they have cord control on the left, raise and lower on the right, a flat pelmet and wooden toggles.